Another Irish emigration sailing disaster | Where's Merrill? I have previously recounted the sorry tale of the plight of dozens of poor Sligo natives who were attempting to escape famine conditions in 1848 by sailing to the Port of Liverpool for onward connections to other far-flung destinations. Half of the passengers never made it beyond Londonderry. Read more here: Sligo sailing disaster. Below is an account of another tragedy at sea, less than 12 months later, this time involving over a hundred souls fleeing from the north-west of County Clare and Connemara in County Galway. On 7th September 1849, the St John, a brig of about 200 tons, sailed out of Galway harbour bound for Boston. She was owned by Henry Comerford of Galway and Ballykeale House, Kilfenora, and Captain Oliver from Bohermore in County Galway was in command. Aboard were nine crew members and about a hundred passengers in two main parties from Clare and Connemara, although later investigations asserted that the captain might have been illegally carrying another 30 emigres not entered on to the official manifest. On Saturday 6th October, the ship came close to land near Cape Cod almost at the end of her journey to Massachusetts Bay. The voyage had been a good one and so the captain issued a ration of grog to the crew in celebration. Captain Oliver suggested to the passengers that they too might celebrate their last night aboard the St John. The Irish human cargo had every reason for merriment; they had left far behind them a country of starvation, disease and death. The voyage had been less of a trial then they had expected and they were in sight of the shores of the Promised Land. They hurried to decorate the rigging and decks with candles and passed the night with traditional Irish songs and dance. At five o’clock in the evening the brig passed Cape Cod Light and by one o’clock in the morning the First Mate guided the St John around Scituate Light. All of a sudden, the ship caught the wind of a fierce north-easterly gale and was soon being driven towards the shore. The rigging was hurriedly adjusted and a new, safer course was set. 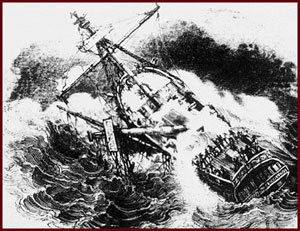 By daylight, the gale had become a full storm and the ship was being blown southwards along the Massachusetts coast. An hour later, on a mountainous sea, the St John was sighted at the mouth of Cohasset Bay. Inexorably the wind drove the little ship closer and closer towards the shore, with all hands on deck fighting to regain control of the St John over insurmountable elements. It was to no avail; the sails were now in shreds and the storm too powerful to fight. Both anchors were dropped but they dragged. As a last resort, Captain Oliver had both masts cut away but the wind and seas were relentless and the brig was helplessly forced onto Grampus Ledge. It was then about seven o’clock on Sunday morning. Enormous waves lifted the stricken vessel and smashed her again and again on the rocks. The impact broke her back and opened her seams. A hole was quickly broken in her hull and those below decks were drowned within minutes. Pounded against the rocks, the brig began to break up. Horrified spectators saw people being “swept in their dozens” into the boiling surf from the crowded decks. Even though they were deafened by the howling of the wind and the thunder of the seas, the watchers were convinced that they could hear the screams of the unfortunates as they were dragged to their deaths. Sickeningly, there was nothing any bystander could do to help. The jolly boat (or tender) had been hanging by its tackle alongside the brig. Suddenly, the stern rigging bolt broke and the small jolly boat fell into the water, in danger of being swept away. The captain, the second mate, two of the crewmen and two apprentice boys jumped into the maelstrom and managed to secure her, but immediately about twenty-five frenzied passengers attempted to board the little boat and it was swamped. Of the people in or around the jolly boat, only one survived – Captain Oliver, who managed to grab a rope which was hanging from the main deck and was pulled aboard the ship by the first mate, Henry Comerford (believed to be a nephew of the ship’s owner of the same name). Another group of passengers jumped into the water in an attempt to reach the overturned jolly boat, but they all perished in the cruel sea. By now the main ship was rapidly disintegrating. The water around her was strewn with wreckage to which people clung desperately even though they were again and again buried beneath tons of water as the colossal waves broke over them. The captain, the first mate and the remaining seven members of the crew eventually succeeded in re-securing the jolly boat using grappling hooks and all safely swam to and (shamefully) boarded the makeshift lifeboat and headed off to shore; only one stranded passenger was collected en route. By eight a.m. the ship had completely broken up and the worst horror was over. In total, eight women and four men had made their own way to the shore, semi-conscious through exhaustion. Two passed away on the beach and the remainder had to have their hands prised from the wreckage which had saved their lives. News of the disaster spread along the American coastline and by early afternoon the shore was lined with people who worked unsparingly to resuscitate the living and retrieve the dead. The survivors had many stories to tell. Two of the women who had fought their way ashore had each lost three children. The human loss was horrendous. A man called Patrick Sweeney of Galway perished with his wife and nine children. 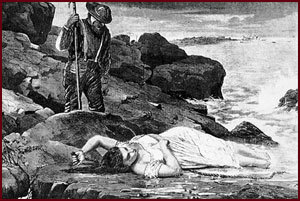 Many of the recovered bodies were badly mutilated by the jagged rocks, yet Sally Sweeney’s features were reportedly “calm and placid as if she were enjoying a quiet and pleasant slumber.” There was one tiny miracle: Mr Lathrop, in whose house the survivors found shelter, waded into the surf to retrieve a parcel of clothing and discovered that he had an infant in his arms. Some days later the baby was said to be in excellent health. A newspaper report of the time says that forty-six bodies had been taken from the sea by nightfall, and that they were coffined in rough deal wood boxes on the beach. The storm raged on at sea for two more days as religious ceremonies on the shore and in the local cemetery took place. Immigrant family relatives rushed from waiting rooms at Boston Harbor to the scene upon hearing news of the disaster. Irish women howled each time a loved one was recognized in the lines of wooden boxes. Many unclaimed victims were buried in a common grave on Tuesday. The funeral party was headed by the captain and the survivors.